Kinshachi IPA is Morita Kinshachi’s take on the India pale ale that has been redesigned and restyled since I last tried it in 2012. How do I remember that? Well, I have some pictures from a trip to Nagoya and the beer is unmistakably in that picture. It’s a 7% autumn seasonal though it has been seen outside of that period so I guess Kinshachi IPA is available all year-round at the time of writing. It is also an award-winning beer, having won two silvers at the International Beer Competition in 2008 and 2009. New style bottle, old style taste. Even with the pictures of Kinshachi IPA, I couldn’t still recall the taste of it or if I had enjoyed it or not. I hoped that upon opening the bottle, my memories would come flooding back and I would remember how I felt for the first time. Alas, nothing came. The deep reddish brown body was as bright as a button, though the head was a dull as dishwater with a murky brown colour and a frothiness that left dirty marks on the side of my glass. Kinshachi IPA had a faint aroma of hops but it is more of an English IPA with a malt front rather than the hop bursting in your face American IPA style that is so common recently, though that maltiness faded quickly. English IPAs had started to show a slow resurgence in the face of the American IPAs though I suspect it had always been hidden, waiting for the polite moment to strike the market. It’s a shame though that Kinshachi IPA won’t be the one to make it. The malts are pretty much all of the flavouring with a wee bit of hop muddled in there somewhere. Besides the initial flavours being present, the malts never seemed to develop into anything nor did it improve as Kinshachi IPA got warmer. Kinshachi IPA is more English IPA than American IPA though it didn’t really excite my taste buds enough to warrant another purchase. Kinshachi IPA can be bought from the Morita Kinshachi online store here as part of a six-pack.. I’ve seen it on sale at Craftbeers.jp here, Sakaya Okadaya here, and GoodBeer.jp here. Moreover, it has also been spotted at Le Collier as well as World Gourmet. I agree. For me, it is more a kind of light-brownish pale ale, and not an IPA at all. It is not bad, especially as I just had it after drinking a Super Dry that someone in the family had bought, but it cannot compare with many other IPAs. I am not sure when the IPA was first produced, as a couple of years ago mostly the red and blue label beers (Pilsner and Alt) from Kinshachi were available. But recently I have seen the IPA very often. You’ve hit the nail on the head. It’s not bad at all but it can’t really stand alongside the IPAs from Baird, Minoh, North Island, Iwate Kura, and Swan Lake among others. 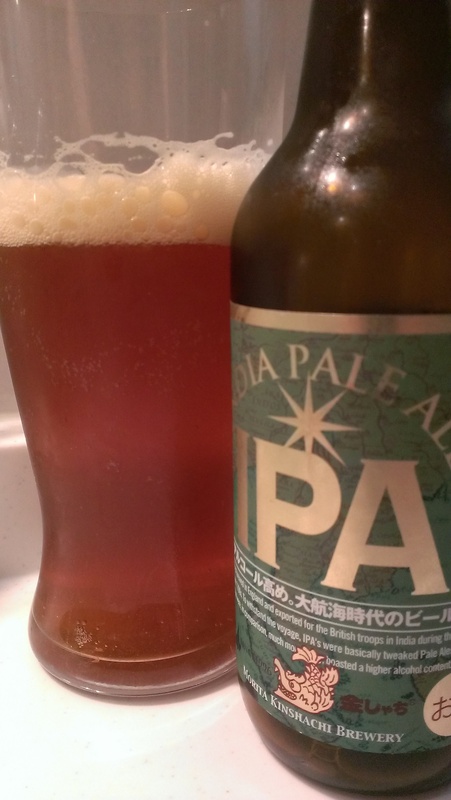 The IPA has become more prevalent across Japan over the last couple of years. Guessing it came out around 2004/5 perhaps but there’s a lack of information.